Today i will discuss about ZTE ZXA10 C220 Epon OLT Specification. C220 is big/middle OLT equipment with high density, high bandwidth and scalable office end equipment of passive optical access. 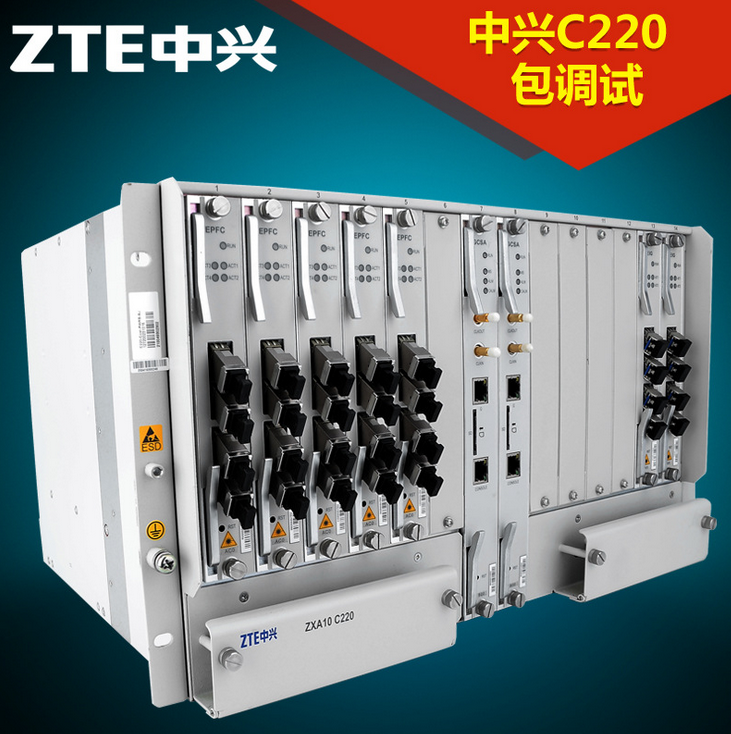 The ZXA10 C220 xPON uniform access platform, reflects the evolution trend of optical access networks, suitable for all kinds of FTTx deployment pattern, provides the HSI, VoIP, TDM, IPTV, CATV, move under 2 g / 3 g, WiFi, etc all fusion access control and management of the business, as well as the QoS and the safety reliability of the telecommunication level security. Two control boards, the model is GCSA, with cable control port, SD memory card ports, etc., as shown. An EIGM board, it is with four cable ports and 2 SFP fiber ports and the modules. A rack fan, it is containing six small fans; 48V power connector; UPLINK port and ports. Accessories are three power lines; 4 fc / lc jumpers, 4 fc / sc jumpers; two labels, 24 small ones of each label; one bag of 20cm straps, one bag of 10 cm straps. A cross-over RJ-45 cable, an RJ-45 turns 9-pin male RS-232 network cable, an RJ-45 turn 9-pin female RS-232 network cable. Nothing else. The system has different kinds of network, service and OAM interfaces, the interfaces are open and compatible. Integrate optical access, data switching and route disposal in one shelf, large amount of subscribers are supported, this help save shelf, rack and equipment room, very easy for investment protection and expansion. Key parts of the system support complete redundancy for active/standby unit. On the other hand, fiber protection is supported to assure access of important users. Have good management, monitoring and testing functions for easy maintenance and fault diagnosis. Support local and remote management and terminal management as well. It has strict control on power consumption, heat dissipation and noise to ensure the least effect on environment. Support local and remote upgrade, it also supports 10G EPON access through inserting 10G EPON card in the existing shelf, this help protect existing investment and provide more bandwidth to subscribers.